A statistical analysis of data collected by NASA's planet-hunting Kepler space telescope during its initial mission shows a better than 99 percent chance that 1,284 worlds previously classified as "candidates" are, in fact, actual planets, researchers said Tuesday. The announcement boosts the total number of confirmed Kepler-discovered worlds beyond Earth's solar system to nearly 2,300, adding additional support to the belief that exoplanets are commonplace across the 100-billion-sun Milky Way galaxy. 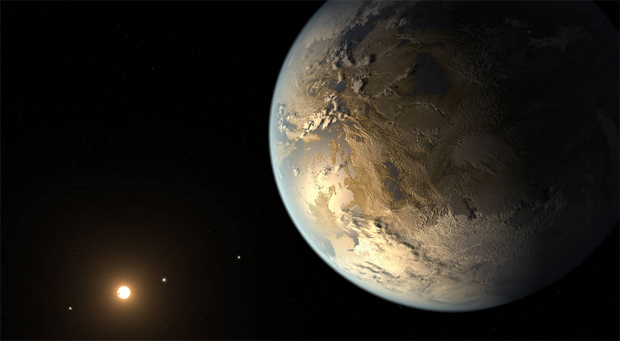 Based on Kepler's discoveries to date, even a conservative extrapolation would indicate more than 10 billion worlds orbiting in the habitable zones of their stars where water and, by extension, life as it is known on Earth could, in theory, exist. "Today, we are announcing the discovery of 1,284 new planets in the Kepler mission," said Timothy Morton, a researcher at Princeton University. "Kepler has been leading in the discovery of planets outside our solar system, and this announcement more than doubles the number of known Kepler exoplanets." The Kepler spacecraft previously had discovered 984 confirmed planets orbiting stars in a patch of sky between the constellations of Cygnus and Lyra. The results announced Tuesday push Kepler's total to 2,268 confirmed, or validated, exoplanets, leaving another 2,034 unconfirmed candidates. Of those, 1,327 are "likely" to be planets while 707 are believed to be "impostors," or false positives. Kepler detects the presence of a planet by studying the light from a star with a 95-megapixel camera. As a planet passes in front of a star as viewed from the spacecraft, the light will dim ever so slightly and then brighten after the planet passes. Such planetary transits have characteristic "light curves" that are different from the curve produced by an impostor such as binary star system with a low-mass component or brown dwarf or even two similarly sized suns in close orbit. "First, we simulate the detailed shape of the signals caused by planets and impostors and then also we simulate how common we expect impostors to be in the galaxy," Morton said. That would include the number of binary stars that might be expected in the observation zone based on known densities and other factors. "Combining these two different kinds of information gives us a reliability score between zero and one for each candidate," he said. "And candidates with reliability greater than 99 percent we call validated planets." During the initial stages of the Kepler mission, astronomers could confirm a planet only after detailed, time-consuming follow-up observations with other ground or space-based instruments. The new statistical approach can sift through data at lightning speed, confirming or rejecting a candidate within a few minutes. The automated technique "enables us to quantify the probability that any given signal is, in fact, caused by a planet without requiring any follow-up observations," Morton said. Launched in March 2009, Kepler completed its primary three-year mission in November 2012. NASA managers promptly approved a four-year mission extension but in 2013, the spacecraft was hobbled by the failure of a second gyro stabilizer, preventing the pointing accuracy required for planet detection. Engineers eventually came up with an ingenious workaround: using the pressure of sunlight to help stabilize the spacecraft. The revamped "K2" mission continued until a series of glitches in April sent Kepler into "emergency mode." Engineers are not yet certain what triggered the problem, but they were able to reset on-board systems and continue observations. The exoplanet discoveries announced Tuesday were based on data collected during Kepler's original mission. So far during the K2 mission, some 270 planet candidates have been identified. "When NASA decided to build and launch the Kepler space telescope, we did not know if exoplanets, especially small, rocky exoplanets, were common or rare in the galaxy," said Paul Hertz, director of astrophysics at NASA Headquarters. Thanks to Kepler and its science team, "we now know that exoplanets are common, that most stars in our galaxy have planetary systems and that a reasonable fraction of the stars in our galaxy have potentially habitable planets, that is, rocky planets in the habitable, or 'Goldilocks,' zone. Knowing this is the first step toward addressing the question, 'Are we alone in the universe?'" Kepler mission scientist Natalie Batalha, asked why school kids should be interested in Kepler's mission, put it like this: "We're going to change the way you're going to see the universe." "When you look up in the sky, you're not just going to see pinpoints of lights and see them as stars, you're going to see pinpoints of lights and see them as planetary systems," she said. "It's part of that larger strategic goal of finding evidence of life beyond Earth, to know if we're alone or not." "Being able to look up and point to a point of light and say 'That star has a living world orbiting it,' I think that's very profound and speaks to questions about why we're here and how we got here."